Scroll down to see the most affordable English degrees, as well as info on the different types of English degrees and English program accreditation. The School of Humanities at UC Irvine offers Bachelor of Arts in English and Bachelor of Arts in Literary Journalism degrees. There is also an emphasis in creative writing available. UC Irvine offers an MA in English Literature during the summer months that is designed for teachers seeking an advanced degree in the field. Classes for this program follow the secondary school calendars as closely as possible, typically beginning in late June and ending before Labor Day. There is a Master of Fine Arts in English degree available, as well as a PhD program with emphases in critical theory, feminist studies, Asian American studies, visual studies, and rhetoric. Undergraduate English majors can apply for the Hester A. Laddey Memorial Scholarship ($3,000). Students pursuing a Bachelor of Arts (BA) degree in English at the University of Minnesota in Duluth can choose one of two tracks offered - literary studies, or literature, language, and culture. Students can earn a Bachelor of Applied Arts (BAA) degree that is offered by the Department of Education in conjunction with the Departments of English, Communication, Linguistics, and Writing Studies. The BAA program is a requirement for students seeking teacher licensure as Minnesota Communication Arts/Literature teachers for grades 5 through 12. The Department of English has a Master of Arts (MA) in English with four areas of emphasis: Literary Studies; Literature, Language, and Culture; Publishing & Print Culture; and, Writing Studies. TAMU's Department of English offers a Bachelor of Arts (BA) in English program with three tracks: Literature, Rhetoric, and Creative Writing. There is also a Professional Writing Certificate available. English majors can apply to a number of departmental scholarship programs including the following: Lou and C.C. Burton '42 Scholarship ($5,000 to $15,000), Natalou T. and Kenneth P. Pipes Scholarship ($2,000 to $10,000), Stewart & Anna Morgan Scholarship ($1,000 to $3,000), and the Carroll Laverty Memorial Scholarship in English ($1,500 to $2,000). On the graduate level, the department offers Master of Arts (MA) and Doctor of Philosophy (PhD) programs. All PhD candidates receive support though assistantships and tuition assistance; there are a limited number of assistantships available to MA students. Whether you want to teach English or are interested in literature in fields such as women's studies or African-American studies, the English Department at all three Rutgers campuses teach relevant coursework. In addition to a Bachelor of Art in English, Rutgers offers accelerated five-year dual degree plans, with the option of earning a Master's in English Education with teacher licensure or a Bachelor and Master of Arts in English. Regular MA programs are also available. The Ph.D. in Literatures in English offers courses in all periods of English and American lit and provides the chance to undertake interdisciplinary studies. Research groups in the English Department range from the African diaspora to poetry to queer studies. The Department of English and Comparative Literature at UNC Chapel Hill offers Bachelor of Arts (BA) degrees in English as well as in Comparative Literature. The BA in Comparative Literature program offers two tracks of study - the International Studies in Literature track and the Global Film and Literature track. Students can opt to have a Creative Writing Minor. English majors can apply for the Thomas Wolfe Scholarship, which provides a full four-year scholarship for a beginning undergraduate with exceptional writing talent and promise. Junior and senior English majors (with a minor in Creative Writing) can apply for the Wanda Chapell Scholarship and the Angela B. Collins Scholarship. The English Department at UCLA offers Bachelor of Arts degrees in American literature and culture and in English. A concentration in creative writing is available within the English major. The department also offers a minor in English and a minor in literature and the environment. For students interested in graduate studies, the department offers a Doctor of Philosophy degree in English. Students can earn a Master of Arts degree en route to the PhD, but it is not offered as a terminal degree. Doctoral students receive full funding once accepted to the program. A number of scholarships and awards (with varying amounts) are available to undergraduates, including the Ruth Brill Scholarship Award and the Harold Dee Fox Memorial Scholarship. In addition to handing out bachelor's, master's and doctoral degrees in English, UIC is one of the few spots to maintain a PhD program in Creative Writing. The department recognizes outstanding undergrads at the end of each year with monetary awards. The largest, worth $1,800, are the Campion and Newton Scholarships for Chicago Public School grads. PhD students must serve as teaching assistants for at least two years, which is good news: Assistantships pay for tuition and some fees, plus provide an annual stipend north of $17,000. Although master's students are not eligible for assistantships, they may qualify for Board of Trustees tuition-and-fee waivers as well as travel funds and small year-end awards. Through its Department of English, Baruch College offers an undergraduate major and minor in English. The English major requires 30 credits of major/specialization courses that focus on literature, creative writing, and language and society. English minors must enroll in two upper-level English courses and one capstone course. In addition, the Department hosts the Sidney Harman Writer-In-Residence Program, which allows outstanding undergraduates to enroll in writing workshops taught by notable visiting professors. The Department of Journalism and the Writing Professions also offers an undergraduate major in journalism and creative writing, which includes a core journalism curriculum, as well as specialization electives in different writing genres. English majors at Baruch College are eligible for the The Donald J. Loff Scholarship for Excellence in English. Vassar offers a Bachelor of Arts in English with seven areas of focus. These "correlates" encompass staple topics such as American Literary History and Creative Writing as well as more progressive sequences such as Race and Ethnicity. Writers are well-represented in the senior awards, with the Beatrice Daw Brown Prize, Deanne Beach Stoneham Prize for Poetry and Sister Arts Poetry Prize all going to, you guessed it, poets. Students can also publish throughout their tenure via the Vassar Review, an annual literary arts magazine. After graduating, writers can vie for the $45,000 Rose Fellowship, which helps them pursue passion projects outside of grad school. University of California Riverside, the lowest-cost school in the UC system, gives more financial aid per freshman than any other public university in the country. Students who then declare as English majors can take advantage of individual achievement awards for outstanding sophomores, juniors and seniors. Each student admitted to the PhD program receives five years of free tuition and a stipend, typically in exchange for teaching duties, and can apply for a sixth. Snagging a fellowship often means additional funding and fewer teaching hours. The Bachelor of Arts in Literatures in English degree at UC San Diego is offered through the Division of Arts & Humanities. Students admitted to the program are required to take three courses in a secondary literature taught in a language other than English. A Doctor of Philosophy in Literature degree is also available. Students are admitted only to the PhD program. A Master of Arts in Literature may be earned en route to a PhD, but the MA in Literature is not offered as a terminal degree. English literature majors with demonstrable financial need can apply for the Gregory T. Bryan Scholarship. This two-year scholarship is open to upper division students and awards amounts of up to $2,000 per year. The Bachelor of Arts (BA) in English program offered by the Department of English at the University of Minnesota Twin Cities program gives admitted students the chance to participate in study abroad programs and several undergraduate conference opportunities. The department offers several scholarships for English majors as well, including the Jessie M. Comstock Scholarship and the Donald V. Hawkins Scholarship. Both programs award $2,000 each to continuing English majors with excellent academic performance. Awards of $1,000 are given the Joan C. Forester Scholarship and the Beverly Atkinson Scholarship for Outstanding Non-Traditional English Majors. The department offers the following graduate programs: Master of Arts (MA) in English, Master of Fine Arts (MFA) in Creative Writing, and Doctor of Philosophy (PhD) in English. The Department of English at Rutgers University offers an undergraduate major and minor in English and an English Ph.D. program. The undergraduate English major consists of 36 major credits, including two courses in literary study and four courses in various historical periods, such as the medieval period, the renaissance period, the restoration period, the nineteenth-century and the twentieth-century and later. The Ph.D. in English requires 42 credits of coursework, a qualifying examination, a dissertation and its defense. The English Department also offers an undergraduate certificate in creative writing that can be completed in 16 credits. Students in the Department have opportunities to study abroad, complete internships, participate in the honors program and compete for various departmental scholarships and awards. Students interested in English can earn a degree in literature or in English education at Buffalo State College. The Bachelor of Arts in English is a 42-credit program that focuses on strong writing skills and a liberal arts education. The Master of Arts in English is a 30-credit program that allows students to study a concentration area in depth. All master's candidates take classes in research and literary criticism. Buffalo State has three programs in English education. The Bachelor of Science is for undergraduates who want certification to teach English. The Master of Science in Education is an advanced program for professional teachers. Students with an undergraduate degree in English can qualify to teach through the English Education Certification program. SUNY Oswego offers undergraduate degrees in English and creative writing, and a Master of Arts in English that meets the needs of elementary and high school teachers, students who want to earn a Ph.D., and students interested in post-secondary teaching careers. Students in the Bachelor of Arts in English program take at least 36 major credits, including classes in text, context, and theories. Students in the B.A. in Creative Writing program take at least 39 major credits and can focus on screenwriting, playwriting, poetry, fiction, non-fiction, or newswriting. Students in the Master of Arts in English program can choose from three tracks: teaching internship, independent study, or thesis. Outlets for student writers include the campus paper and creative writing journal. English majors at the University of California Berkeley can qualify for honors by taking the two-semester honors course sequence where they study critical theory and complete an honors thesis. The English major requires at least 12 English courses, including seven upper-level courses. Outside of class, students can take part in social and educational events organized by the English Undergraduate Association, share their works in an informal creative writing workshop, and mingle with faculty and English grad students through Berkeley Connect. The department also grants a Ph.D. in English. Students who complete the Ph.D. coursework can petition for a Master of Arts in English with an emphasis in creative writing. The English Department at the University of California Davis grants a bachelor's degree in English, a Master of Arts in English-Creative Writing, and a Ph.D. in Literature. Undergrads can sign up for the honors program in criticism or creative writing; each program includes courses and an honors thesis. Students can apply for a Provost's Undergraduate Fellowship to fund the costs of a research project. English majors get together for social activities in the Beyond the Book Club, and outstanding students can join the Sigma Tau Delta English Honor Society. Graduate students are eligible for fellowships and teaching assistantships that provide a stipend. The graduate English program was No. 20 on the 2018 U.S. News list of best Grad Schools. English majors can choose between concentrations in literature or writing, or get their licensure to teach high school English in Massachusetts. Westfield also hosts three variations of the English MA - a standard degree and two that incorporate teaching licensure. Students with a 3.0 average qualify for membership in Sigma Tau Delta, but anyone with skills can submit to the school's literary arts journal, Persona, which the English Club produces. The Poetry Club is another popular outlet for expression. For funding, a lucky few will win the Welch Scholarship or Loughman Scholarship, the latter of which considers financial need. The Wefing Journalism Scholarship, meanwhile, goes to Communications or English majors who aspire to be journalists. English majors at Barnard College may choose to concentrate in American literature, creative writing, film, or theatre, or they may pursue a general English undergraduate degree. Depending upon concentration, English majors take a minimum of 10 or 11 classes in their major, typically including classes in critical writing, literature of specific periods, and senior seminars. Barnard students are eligible for several English Department prizes, including the Azinn Foundation/Anna Quindlen Award for Creative Writing, the Brandt Playwriting Award, the Peter S. Prescott Prize for Prose Writing, and the Lenore Marshall Poetry Prize. The college hosts many readings by poets and writers each semester. Students who major in English at SUNY Oneonta can choose a minor in an area such as linguistics, classical studies, or professional writing to specialize their degree. The English Department and members of Parnassus, the English Club, organize an annual undergraduate literary and composition conference, which is notable because most such conferences are limited to graduate students. English majors also have the opportunity to share their work with the Creative Writing Club or to help produce the student-run Art & Scope literary magazine. Oneonta also hosts a speaker series that brings in prominent writers and poets. English majors are encouraged to find an internship, which can result in academic credit. The Department of English at Appalachian State University offers several degree options for undergraduate and graduate students. Undergraduate options include a BA in English and a BS in English Education. The BA is offered in four concentrations: creative writing, film studies, literary studies and professional writing. Students who choose the creative writing concentration take coursework in poetry, fiction, creative non-fiction and screenwriting, while literary studies students focus on British, American and world literatures. Graduate students can earn an MA in English or an MA in English Education with a concentration in college teaching. The English Department offers many scholarships to its students, including the English Department Scholarship and the Ella Thompson Hobbs Endowed Scholarship for English Majors. Students admitted to the Bachelor of Arts (BA) in English program offered by the Department of English at UMass Amherst can focus on areas such as ethnic American literature, Renaissance studies, and world literature in English. Students can apply for financial assistance from the following scholarships: General John J. & Evangeline W. Maginnis Scholarship, Cleo Zoukis Ploussios Memorial Scholarship. Mary McGarry Morris and Margaret C. Chiriaco Scholarship, and the Frank Prentice Rand Scholarship. The following graduate programs are offered: Master of Fine Arts (MFA) in Creative Writing, Master of Arts (MA), and a Doctor of Philosophy (PhD). Graduate students can choose to specialize in one of three areas of concentration: American Studies, Composition and Rhetoric, and Early Modern and Renaissance Studies. Undergraduate students studying English in Saint Cloud State University's Department of English can earn a BA in English with concentrations in general English, literature, creative writing, linguistics, and rhetoric and writing. A BS in Communication Arts and Literature is also available, as is an MA in English, an MS in English, an MA in Teaching ESL and an MA in Rhetoric and Writing. English students can also participate in various student groups and activities, including the Creative Writing Club, the TESLA Club and the literary arts publication Kaleidoscope. English students are eligible for numerous scholarship opportunities through the Department, including the $500 Donna Gorrell English Scholarship for Creative Nonfiction Writers and the June Hiemenz Spychala Memorial Scholarship, which ranges between $300 and $1,000. Michigan Technological University's Department of Humanities offers Bachelor of Arts degrees in English and English Secondary Education. The B.A. in English teaches students about research, writing, literature, cultural studies, film and rhetoric through 63 major credits of coursework. The B.A. curriculum includes 24 credits core coursework; nine credits related to authors, genres, periods and movements; three credits of world literature coursework; six credits of modern language coursework; and six additional credits, in which students have the option to complete an internship. The B.A. in English Secondary Education has similar requirements to the B.A. in English, however it also teaches students how to relay what they learn to young adults in a secondary classroom setting. The School of Arts and Humanities at Wayne State College offers a Bachelor of Arts (BA) in English where students are allowed to focus on writing or literature or a combination of both. The department also offers an undergraduate endorsement in English as a Second Language, which is designed to supplement a secondary or elementary endorsement. This is an interdisciplinary program of study with students taking courses from the Communication, Education, and English departments, plus a year of foreign language study. Students can also participate in a number of educational opportunities such as study abroad options and the Neihardt Seminar, which is a summer course taught by a visiting writer or scholar who is prominent in their field. The College of Liberal Arts at CSULB offers a Bachelor of Arts in English program with options in creative writing, literature, rhetoric and composition, and English education. A Special Emphasis option is available for students who wish to pursue a particular interest not covered by any of the options offered. Master of Arts in English and Master of Fine Arts in Creative Writing degrees are also available. Students who plan to teach English to middle and high school students after graduation should take the Single Subject Credential Program (English). English majors can submit up to five poems to be considered for the William T. Shadden Memorial Awards ($2,000). The Elizabeth E. Nielsen Scholarship considers students with excellent academic performance and demonstrable need. Iowa State University's Department of English offers several degree options for both undergraduate and graduate students. Undergraduate students can choose from majors in English, linguistics, speech communication and technical communication. Graduate students can choose from an MA in English with specializations in literature and literature and the teaching of reading, an MA in Rhetoric, Composition and Professional Communication, an MA in Teaching ESL/Applied Linguistics, an MFA in Creative Writing and Environment, a PhD in Applied Linguistics and Technology, and a PhD in Rhetoric and Professional Communication. Scholarships available to students in ISU's English Department include the $2,000 Herta David Scholarship in English and the $1,000 Aubrey E. Galyon Scholarship. The Department of English at the University of Florida offers a Bachelor of Arts in English, as well as a Master of Fine Arts (MFA) in Creative Writing and a Doctor of Philosophy (PhD) in English. An Asian American Studies (AAS) Certificate program is also available. The AAS certificate is a 12-credit interdisciplinary program focusing on Asian American racial politics, gender issues, and culture. Academically outstanding undergraduate or graduate female students can apply for the O. Ruth McQuown Scholarship Awards ($3,000). The department's Norton Scholar's Prize is given for the best undergraduate essay on an aspect of American literature ($2,500). Students with demonstrable financial need can apply for the Lipsky Award, which is a $200 one-time book grant. Berea College offers a Bachelor of Arts in English with concentrations in literature and writing, as well as an undergraduate minor in English. Both concentrations require two core courses in literature and creative writing, a capstone seminar and the completion of a portfolio. Students in the literature concentration are also required to complete five additional literature courses, one language course and an English elective, while students in the writing concentration are required to complete three additional writing courses, one language course, two literature courses and one English elective. English students enrolled in the literature concentration have the option to earn secondary teaching certification by double majoring in teaching and curriculum. The Division of English at Alfred University offers an undergraduate major in English and minors in writing and literature. The English major requires 44 major credits, including coursework in British literature, American literature and the language of literary art. Both the writing minor and literature minor require 20 credits of coursework. The writing minor is designed for students with an interest in writing poetry, short fiction, creative nonfiction or drama, while the literature minor is designed for students with a love for literature and an interest in pursuing careers in law, business or education. Michigan State University's College of Arts and Letters offers undergraduate and graduate degrees in English through the Department of English. Degree options include a BA in English with concentrations in literary studies, creative writing and popular culture, a BA in English with secondary education teaching certification, an MA in English and a PhD in English. Additionally, the College of Arts and Letters offers a BA in Professional Writing, an MA in Critical Studies in Literacy and Pedagogy, an MA in Digital Rhetoric and Professional Writing and a PhD in Rhetoric and Writing through the Department of Writing, Rhetoric and American Cultures. The Department of English provides its students with scholarships ranging from $200 to $3,000, including the James D. Rust Scholarship (minimum $1,000) and the Dr. Ellen Brown Scholarship I (minimum $1,000). The English Department at Queens College grants a Bachelor of Arts and Master of Arts in English, Master of Fine Arts in Creative Writing and Literary Translation, and in conjunction with the Secondary Education Department, Master of Science in Education in English. Undergrad English majors must earn 46 English credits beyond basic composition classes. They are required to take two critical reading and writing courses, four literary research method courses, seven electives, and a senior seminar. The M.A. requires 30 credits and allows candidates to specialize in British, American and other Anglopone literatures. Students in the M.F.A. program may earn a degree in poetry, prose, playwriting, or literary translation. Departmental scholarships include the Betty Zolot Scholarship in creative writing. Undergraduate students at Brigham Young University-Idaho can major in English or English education through the Department of English. The BA in English offers concentrations in literary studies, professional writing and creative writing. The BA in English Education prepares students to teach literature and composition in grades 6-12. Students interested in earning a master's degree can also participate in the five year BA/MA program BYUI offers in conjunction with Idaho State University. Additionally, English students can participate in student organizations such as the English Academic Society (EAS), which hosts a pre-professional conference, monthly lectures and workshops and trips to undergraduate conferences. Northwest Missouri State University's Department of English and Modern Languages offers Bachelor of Arts, Bachelor of Science and Bachelor of Science in Education degrees in English. Master of Arts and Master of Science in Education degrees are also available in English. The B.A. in English requires 30 major credits, while the B.S. requires 36 major credits. The B.S. has a more professional focus than the B.A., with students completing a required course in writing for the professions and a professional portfolio. The B.S.Ed. degree can be completed in English or in comprehensive English, with both options preparing students to teach English at the high school or middle school level. The comprehensive English major, however, requires 55 credits of major coursework and no minor, while the traditional English major requires 39 major credits and a minor. The English Department faculty at City College of New York includes award-winning novelists, memoir writers, and poets as well as scholars in literary theory, criticism and history. Undergrads seeking a Bachelor of Arts in English can concentrate in Literature, Secondary English Education, or Creative Writing. Graduate programs include a Master of Fine Arts in Creative Writing, Master of Arts in Literature, M.A. in Language and Literacy, and a joint M.A. in English and American Studies. The department sponsors many readings and guest lectures and is home to two literary magazines. Students studying English literature and a classical language may be eligible for the Isaacs Scholarship, which provides up to $20,000 and qualifies recipients for the English Honors program. Students majoring in English at Hunter College can choose from one of five concentrations: Literatures, language, and criticism; creative writing; preparation for secondary school teaching; English language arts; or linguistics and rhetoric. Each undergraduate program requires students to complete at least 39 credits in English to earn their bachelor's degree. Graduate students may seek a Master of Fine Arts in Creative Writing or pursue a Master of Arts in English for Adolescence Education or an M.A. in Literature, Language, and Theory. The Adolescence Education program is for students who are not already certified to teach English, and requires candidates to take 15 credits in English classes and 22 to 24 credits from the School of Education. The English, Speech, & Foreign Languages at Texas Woman's University offers a Bachelor of Arts in English and a Master of Arts in English. The B.A. in English has two different tracks: the Writing & Rhetoric Track and a Literature Track. Students may join Omega Rho Alpha, the English honors society open to freshman and sophomores, as well as Sigma Tau Delta, another international English honor society. Students may qualify for scholarships like the Dr. Helen Benjamin Scholarship, the Helen Bass Dailey Endowed Scholarship, the Edith and Edgar Deen Scholarship, the Lavon B. Fulwiler Endowed Scholarship, and the Dr. Leslie R. Kreps Endowed Scholarship, among others. Brooklyn College grants both a Bachelor of Arts and a Master of Arts in English as well as a Master of Fine Arts. At the undergraduate level, students choose either a standard English concentration or a History and Literature concentration. To earn the B.A., students complete 39 to 42 credits in English classes, including five courses selected from periods of study ranging from the Middle Ages to Postmodernism. The master's program requires students to complete 33 credits, including three courses in the candidate's area of specialization. The two-year M.F.A. program allows candidates to specialize in fiction, poetry or playwriting. Departmental scholarships include the Barbara Norville Scholarship in English (amount varies), given to an outstanding freshman English major. Students accepted to the Bachelor of Arts (BA) program at SUNY Plattsburgh's English Department can choose from three available majors: Language Arts, Writing Arts, and Literature. Graduates of the BA in Language Arts program meet New York State subject area requirements for English 7-12 certification; the program is designed for students who want to teach English at the high school level. The Writing Arts program provides students with the foundations of creative writing (poetry and fiction) as well as technical writing (articles and reports). The BA program in Literature prepares students for careers in a wide range of fields such as law, college teaching, publishing and editing. The Department of English at the University of North Texas offers both undergraduate and graduate degrees in English and creative writing. English majors go on to pursue many different career paths and/or graduate studies. Many English graduates become teachers, lawyers, editors, writers, politicians, and publishers, among other things. English majors may qualify for such scholarships as the Ernest S. Clifton Memorial Scholarship, the Arthur Sampley Memorial Scholarship, the English Department Scholarship, the Mary E. Whitten Scholarship, and the Imogene Bentley Dickey Mohat Scholarship. Honors students may participate in the Honors College Capstone Thesis, a major creative or research project. Stanislaus State University offers a Bachelor of Arts (BA) in English program that gives students the option of pursuing a concentration in TESOL (Teaching English to Speakers of Other Languages). The BA in English degree fulfills the subject matter competency requirement for students who plan to seek single subject teaching credential in English language arts. Stanislaus also offers a Master of Arts in English with three areas of concentration: literature (LIT), rhetoric and the teaching of writing (RTW), and TESOL. Concentrations in the MA program may be combined. Liberal Studies students have the option of choosing English as their field of concentration. Continuing full-time English majors with excellent academic performance can apply for the Doug Taylor Memorial Scholarship (variable amount). English graduates tend to be greatly mocked and largely unappreciated. But if you look hard enough, you’ll find them everywhere – penning novels, editing books, creating advertising campaigns, marketing products, running PR departments, drafting technical reports, analyzing public policy, running non-profit organizations, instructing K-12 children, and teaching English as a second language. Thanks to their critical analysis and research skills, they find work in all kinds of places – including educational websites. 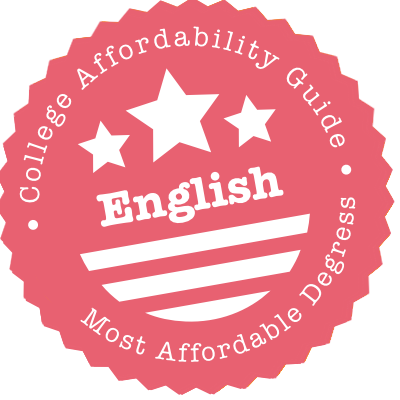 If you’re intent on becoming an English major, check out our quick guide to affordable English programs. From degree choices (BFA vs. BA) to sample coursework (TESOL vs. K-12 teaching vs. literature) to career opportunities, we cover everything you need to know about the field, including what to look for in online programs. For aspiring teachers, we’ve also included a section on important teaching certifications and licenses. An associate’s degree in English is a 2-year undergraduate program that gives students a foundation in communications, English literature, writing, and critical analysis. This degree is offered by a wide variety of community colleges and universities. A GED or high school diploma is required to apply. Graduates of associate programs often decide to earn a bachelor’s degree. If you are thinking about this option, make sure your associate course credits will be transferable to the BA program of your choice. Almost all English degrees are offered as an Associate of Arts (AA). This is an interdisciplinary program that mixes general education requirements with courses in English language and literature. However, each degree is unique. For example, an AA in journalism or technical writing might include courses in digital communication, editing, and publication software. Check the syllabus for details. A bachelor’s degree in English is a 4-year undergraduate program that provides students with a comprehensive knowledge of English language and literature. Specialist degrees in journalism, linguistics, TESOL, and teacher education are also available. A GED or high school diploma is required to apply. Bachelor of Arts (BA) or Bachelor of Science (BS) in English/Teacher Education: Targeted at students who are interested in teaching English to K-12 students and earning state licensure. Emphases may be available in English as a Second Language (ESL). A bachelor’s degree is the minimum academic degree requirement for teaching jobs. Bachelor of Arts (BA) in Teaching English to Speakers of Other Languages (TESOL): Intended to prepare graduates to become certified as TESOL/TEFL instructors and teach English as a Second Language (ESL). Bachelor of Fine Arts (BFA) in Creative Writing: A skills-focused degree designed for students who are interested in becoming professional writers (e.g. copywriters, poets, authors, freelance writers, web writers, etc.). To widen their job prospects, some students choose to pursue a double major (e.g. English & business) or use English as a minor instead of a major. The first two years of a BA in English tend to be a mix of liberal arts/general education (e.g. math, science, etc.) and fundamental coursework in language and literature (e.g. critical analysis, world literature, modern fiction, etc.). Once schools are happy that you have a strong skills base, they’ll allow you to concentrate more on electives (e.g. Shakespearean drama, linguistics, etc.). BFA students spend a great deal of time practicing their skills. For example, creative writing majors may be asked to write short stories, poems, and plays. Media and technical writing majors may be crafting business reports and web content. Degrees in education are intended to prepare you for teaching. In addition to classes in English language and literature, you’ll often be taking courses in curriculum development, assessment methods, intercultural studies, and educational theories. Look for programs that give you plenty of practice time in the classroom. They should also clearly state that they will prepare you for state licensure or TESOL certification. Take it from one who knows – it can be extremely difficult to make your living solely on creative writing. Most writers need to supplement their income with other jobs. If you wish to become a teacher, you will need to think about licensure and certification. Instead of going straight into the workforce, some English graduates also use the bachelor’s degree as a basis for graduate work in English or a professional degree in law. A master’s degree in English is a 1-3 year graduate program that allows students to focus on advanced study and research. Many entrants who pursue this degree are working professionals who wish to advance their careers (e.g. teachers interested in earning a master’s degree in ESL, aspiring authors pursuing an MFA in creative writing, etc.) or academics intent on a PhD. Entrants are expected to have a bachelor’s degree in English or a closely related field. Master of Arts (MA) in English Language & Literature: Often earned by students interested in research and academic study. Master of Fine Arts (MFA) in Creative Writing: Tailored to authors, poets, and non-fiction writers. Some students find that an MFA also gives them valuable contacts within the publishing world. For more info on playwriting MFAs, see our article on Affordable Drama/Theater Degrees. For details on screenwriting MFAs, check out Affordable Film Degrees. Master of Arts in Teaching (MAT)/Master of Education (ME) in English/MA in English Education: Typically aimed at teachers and administrators at the K-12, university, and community college level who wish to improve their job opportunities or become state licensed/certified. Master of Arts (MA) in TESOL: Targeted towards ESL teachers who might enjoy teaching at language centers and community colleges, but want to be eligible for salary bumps or better positions in K-12 schools, universities, and colleges. MA programs in English literature often include courses in critical theory & practice, research, literature, and rhetoric. MFA programs in creative writing will feature hands-on courses where you will be required to write poems, short stories, and novels. MA programs in TESOL will cover areas such as linguistics, pedagogy, language assessment, curriculum design, computer assisted language learning, etc. Like any master’s program in education, the degree includes teaching practicums and internships. You may also be able to focus on a track such as K-12 licensure or TEFL (Teaching English as a Foreign Language). As part of your master’s degree, you will usually be expected to write a thesis or complete a capstone project. A master’s degree can set you up for higher level positions in your field (e.g. education administration, publishing, etc. ), prepare you for a PhD, or help you concentrate on area of particular interest in your career (e.g. creative writing). Graduates with a master’s degree are usually eligible to teach at community colleges. But you don’t need an MFA or MA to become a writer. For that, you need talent, luck, and a fall-back career in case things don’t work out. Consider your budget and your goals carefully before you make the decision to go to graduate school. A doctorate in English is an advanced graduate degree that takes 3-7 years to complete. Since it is intended for aspiring university professors and high-level administrators, it is heavily focused on research. Unless you enroll in a combined master’s/PhD program, a master’s degree in English or a related field is required to apply. Doctor of Philosophy (PhD): A research-focused degree aimed at students who wish to become researchers or university professors. Doctor of Education (EdD): An education-focused degree designed for students who have earned a master’s degree in English education or TESOL, literacy, early childhood education, etc. PhD candidates may be exploring areas such as genre studies, literary criticism, textual analysis, advanced rhetoric, etc. EdD candidates may focus on areas such as pedagogical theory, curriculum development, assessment methods, etc. In the last few years, students have more freedom to focus on original research, exploring a topic of literature, language, or education. This work must be written up in a dissertation. As preparation for their future careers, doctoral students also often teach undergraduates during this time. PhD graduates tend to become academics and faculty (e.g. tenured professors) at universities and colleges. They may also work as publishers, researchers, and high-level administrators. EdD graduates often occupy leadership positions in K-12 schools (e.g. district curriculum supervisor) or become education professors at teaching-focused universities and colleges. A certificate in English (e.g. technical writing, professional/web writing, etc.) is an academic, non-degree program that focuses on specific skill sets. It usually takes less than a year to complete. Certificates are widely available from universities and colleges, and online offerings continue to grow in popularity. Undergraduate Certificate in English: Roughly the equivalent of a minor, this can be used to supplement an existing BA or earn credits for an undergraduate degree. Graduate Certificate in English: Intended for working professionals who wish to acquire certain skills for their career, improve their job opportunities, and/or earn credits for a master’s degree. If you are thinking about using a certificate to earn course credits for a degree, first make sure that your credits will be transferable to the degree program of your choice. Some schools are very picky about transferring credits. Many regionally accredited colleges and universities now offer graduate certificates in ESL or TESOL. In addition to participating in student teaching/classroom practicums, you’ll be studying areas such as cultural understanding, TESOL techniques, ESL reading and writing, etc. Check the curriculum carefully. If you’re thinking of teaching overseas, you should be satisfied that employers will recognize the qualification. If you’re seeking endorsement, first make sure that your certificate program is recognized by the state. For more advice on becoming an ESL teacher, see our section on TESOL/TEFL certification. As a general rule, your college or university should have regional accreditation. This is a “seal of approval” granted to institutions (e.g. non-profit and public colleges and universities) by one of six regional accrediting bodies (e.g. North Central Association of Colleges and Schools). Regional accreditation only applies to a college or university. There is no specific accreditation for English degrees in language and literature, but if you’re thinking about earning an education degree, check out our section on CAEP (NCATE + TEAC) accreditation in our article on K-12 Education degrees. If you’re thinking about becoming a K-12 teacher in a public school, you will need to complete a teacher certification program or a teacher education degree and earn a state teaching license. For more about your options, including information on alternative teacher certification programs, check out our article on K-12 Teaching. Once you have your initial state license, you may wish to consider earning an endorsement on your license to teach English Language Learners (ELLs) or to teach English as a Second Language (ESL). To earn an endorsement on your teaching license, your TESOL program must be approved by your state. Please check with your State Department of Education for precise details on endorsement requirements. The baseline requirement for teaching English as a Second Language (ESL) is a bachelor’s degree in Teaching English to Speakers of Other Languages (TESOL), English, linguistics, or a related field. If you don’t hold a degree in TESOL, your employers will probably want to see that you have earned a TESOL certificate. Although there is no official certifying organization for ESL teachers, this certificate is the standard qualification for entry-level jobs. The 120-hour TESOL certificate is offered by a huge variety of institutions, in both online and on-campus forms. Unless you already have teaching experience, you should probably opt for an on-campus program. This will give you the chance to practice your work in real classrooms with real students. However, you may be able to find hybrid TESOL certificates that combine online courses with practicums in your area. Take some time to research your options. A strong TESOL certificate program will give you plenty of opportunities to practice your teaching skills. For extra reassurance, see if the program is offered by regionally accredited college or university. If you’re interested in Teaching English as a Foreign Language (TEFL) to adult learners, the most respected certificate is Cambridge University’s Certificate in Teaching English to Speakers of Other Languages (CELTA). For more information on education and career options, have a look at the TESOL International Organization website.